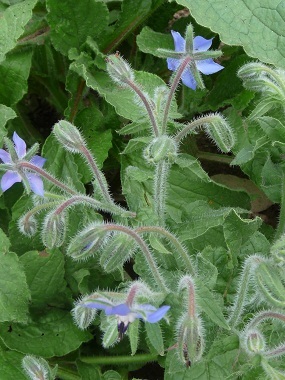 Borage is a hardy annual edible that is known for its beauty. It’s a domestic herbal remedy that has been used since ancient times. Some people use borage as a substitute for valerian as it dispels melancholy and induces euphoria. Borage has a beneficial effect on the heart, adrenal glands, kidneys and the entire digestive system. It has been used as a cure for jaundice. This beautiful plant works well as a companion plant as it deters tomato hornworm and Japanese beetles; it also stimulates the growth of strawberries. Distinguishing Features: Borage is a somewhat gangly plant, but because the star-shaped flowers are so vibrant, this isn’t really noticed. They’re brilliant blue, hanging in downward facing clusters. 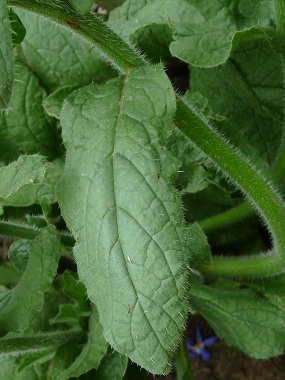 As the plant matures the stalks and leaves become covered with prickly fuzz. 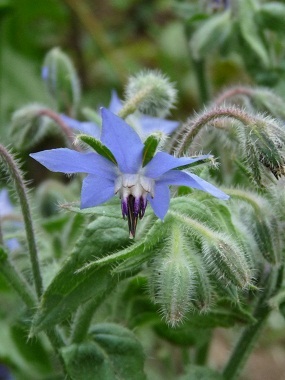 Flowers: Borage has brilliant, blue flowers that are star-shaped with prominent black anthers forming a cone-like structure. 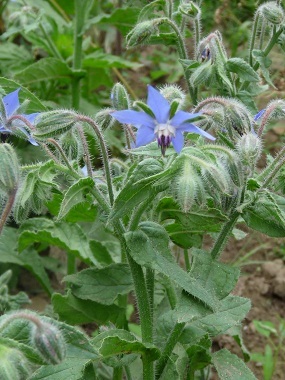 Fields of Nutrition has medicinal benefits and vitamin/mineral content of Borage. Leaves: The leaves are broadly ovate and stalked and measure between 4 and 10 cm. in length. They are covered with whitish bristles that can feel rough-hairy. Height: Borage can grow up to 1 metre tall but tends to average at about 80 centimetres. 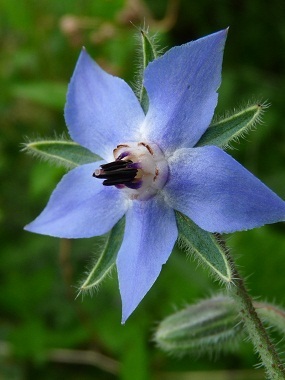 Habitat: Borage can grow wild in woodlands and pastures. It is also a cultivated herb that many people grow in their gardens. Edible parts: Leaves have been traditionally used to make a tea to rid the body of a fever. Although they can be cooked eating them raw is not recommended due to the ‘prickles’ it is best not to. Flowers are very tasty and can be tossed into salads or they can be crystallized to make a “candy.” The seeds are a rich source of gamma-linolenic acid; this oil helps to regulate the hormonal systems and lowers blood pressure. An edible blue dye can be obtained from the flowers; some people use it to colour vinegar however it turns pink on contact with acids.